To ensure that a home or commercial business is clean, comfortable and maintains good air quality, a combination of HVAC components work together. There are 8 basic components, including the thermostat, furnace, heat exchanger, evaporator coil, condensing unit, refrigerant lines, ductwork and vents. Needless to say, when one or more components fail to function properly, the ability of the HVAC unit to circulate hot or cold air as necessary is affected. As the most visible part of a heating and air conditioning unit, a thermostat is typically mounted on a common wall. Thus, property owners program the thermostat based on the needs of the home or building. When temperatures rise or fall below the desired temperature, the thermostat signals the heat exchanger or evaporator coil-condensing components. The heat exchanger is nestled within a furnace, and is predominantly used during winter months. As such, it pulls in cold air, heats it, and redirects the warmed air through ducts and eventually through vents within a space. On the contrary, the evaporator coil is positioned on the outside of a furnace. Akin to a radiator in an automobile, the evaporator coil produces cool air that is sent to the ducts and vents. 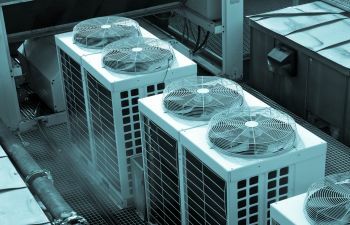 The condensing unit, which is an essential part of an HVAC system, is connected to the evaporator coil. Most are familiar with this structure, as it is a cube-shaped unit installed along the outside of a home. Filled with refrigerant gas from tiny copper or aluminum tubes, the condensing unit transfers the gas into a liquid, and sends it back to the evaporator coil. As mentioned, the furnace is a vital component of an HVAC system, including its largest part. For this reason, a furnace is usually placed in a basement area. Furthermore, its primary job is to heat air, and this is accomplished through various heat sources. These might include combustion (burning gas, oil, coal or propane), resistivity, a heat pump or through solar power. In any case, whether heated or cooled, the treated air eventually enters a space through rectangular outlets or vents. With a greater understanding of how HVAC components work together to heat or cool a space, it’s easy to see the importance of regular HVAC maintenance. The professionals at ClimateSmith, LLC, are licensed and insured technicians with a reputation for superior service and integrity across Atlanta and North Georgia. To schedule an appointment, or to inquire about a system efficiency analysis, call today!